There’s no word on whether or not AC/DC are touring in 2012 – but their singer definitely is. Brian Johnson has announced a short tour in February to promote his recently-released book, "Rockers And Rollers: A Full Throttle Memoir." But this isn’t a typical book-signing trip: it’s a speaking and live performance event. For “Rockers & Rollers - A Full Throttle Evening of Stories and Music with Brian Johnson of AC/DC,” the singer will recount stories from his book, and he’ll be joined by two pals from Skid Row – bassist Rachel Bolan and guitarist Scotti Hill. Lighting and multimedia presentations that will illustrate the stories will be designed by Cosmo Wilson, who worked with Brian on the recent record-breaking AC/DC world tour. 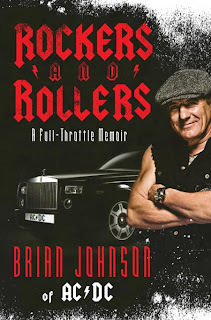 Released in May, "Rockers And Rollers: A Full Throttle Memoir" details Brian’s history - from teenage memories in the backs of beat-up coups to a side career as a racecar driver, Johnson shares his tantalizing life story — a memoir told through his lifelong love affair with cars. Check your local ticket provider and/or venue for on sale dates near you.